Positioned between two homes in a residential neighborhood on a formerly overgrown lot, the North Fork Bluff House highlights panoramic views toward Long Island Sound. Previously only appreciated by means of a treacherous climb to the bluff through thick pricker bushes, the clients wanted a multigenerational home where they could enjoy the dramatic outlook to the water. In order to achieve a tranquil refuge for the family, the view needed to be balanced with privacy from the neighbors. As the lot is not particularly large, the vegetation on much of the site would be cleared to make room for the house, so privacy needed to be addressed architecturally. Additional challenges included budget, site disturbance limitations near the bluff, and a need to accommodate three generations – the owners are three siblings, who planned to share the house as a summer retreat with their spouses, parents, and young children. Both the plan and section were conceived with view and privacy in mind. The North side opens to the Sound with full height sliding glass doors. The South side, facing the street, has a few strategically placed windows at the entry. To keep the façade from feeling static, cedar slats intermittently wrap the cement board panels, dissolving the surfaces as they transform from siding to screens and railings. At the entry, the earth slopes to allow light into the large basement windows, which, because of the grade change, cannot be seen from the street. In plan, the house is shaped like a “Z”; the two side wings are positioned to block the neighboring houses from the front porch and rear pool deck. A cedar slat wall along the pool deck provides additional screening. The entry sequence balances a sense of arrival with privacy. Two grassy berms flank the drive. From the autocourt, a bridge leads to the front door, hidden around the corner. Once inside, the house opens to the stunning ocean view. To manage costs and minimize site disturbance, the house was designed for and built using modular construction. Four modules were fabricated off-site in four weeks, then shipped to the site and set onto a concrete foundation in one day. The modular construction process also helped minimize the construction schedule – critical for a summer home where missing a season is heartbreaking. The four bedrooms and baths, located in the two side wing modules, are equitably designed for the three siblings and their parents, which also helped keep costs down by taking advantage of economies of scale in factory production. The other two modules are combined to form a large communal living space with smaller breakaway spaces at either end. The daylit basement serves as a kid zone with a large playroom and bunkrooms. The entire roof surface is utilized for additional living space, where views to the water are even more spectacular. 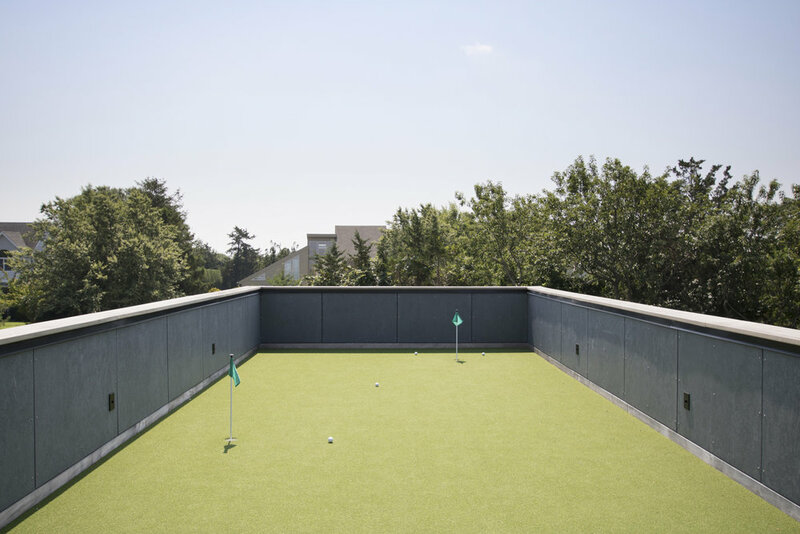 A large roof deck is shaded with a trellis, and the two side wings are topped with artificial turf ‘green’ roofs to create a putting green and bocce court.